“Test me in this.” There is only one place in the Bible where God says this. He’s talking about his directions to us to give him back a small piece of everything he has given us. 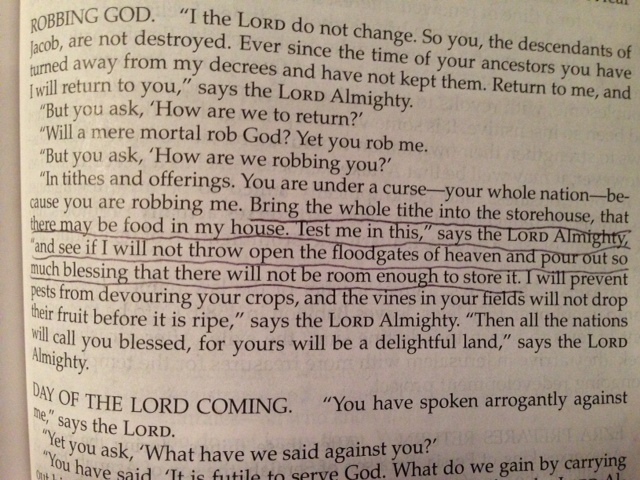 When we are faithful in tithing, God throws open the floodgates of heaven and pours out his blessings upon us. God challenges us to test him because he always responds. He challenges us to give back a portion because our trust in him needs to grow to the point where being faithful is more important to us than the money. God needs to be a higher priority in our hearts than what this money could buy. This is important for our happiness. We won’t have the peace, contentment and joy that God wants for us until we can gladly give back a portion. I have to admit – it took God and my husband awhile to convince me of this. I always felt that we didn’t have enough money to tithe. Other people who had a lot more money could tithe – but not us. When the topic came up, I always hoped that someday we would make enough money so we could tithe. I have realized a very crucial truth in this area – if it’s all about having enough money, there will never be enough. God tells us in Luke – if we’re not faithful with a little, there is no way we’ll be faithful with a lot. God wants us to find peace and contentment with what he has already given us. When we are faithful, he pours out the blessings that money can’t buy. When we follow God’s directions for our lives, we are putting ourselves under the umbrella of his blessing. If we don’t follow his directions to us in the area of money, we are holding our wallets out from under the umbrella of his blessing. The result is that God will not bless our finances. We will have constant money issues until we bring our wallet back under the umbrella by getting in line with God’s direction for this area of our lives. His direction is to sacrificially tithe and to give offerings above our tithe. Because we love God. He’s more important than the money. And we trust him. God’s got this. We can even test him.